DataPipe is so cool! Previously database transformations called for painful Perl coding, or somewhat less painful but more cumbersome PHP coding. With DataPipe such transformations can be done quickly just by simple filters or by crafting a RegEx filter (which is actually fun with help of EasyPattern Helper). Leave data in your database; Modify in-place! With DataPipe there is NO need to export and then import your data after changing it. DataPipe applies TextPipe filters to each column of data you specify, so whatever you can do with TextPipe you can also do to a column of data in your database. e.g. Search and Replace (with prompting and pattern matching), Capitalization, Encryption, change Character set encodings, your own custom JScript/VBScript and much more. 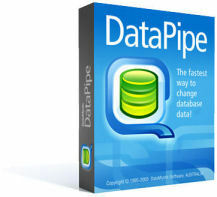 DataPipe includes TextPipe Pro, and applies its amazing text processing capabilities to data in your database. TextPipe provides a huge range of filters for manipulating text. DataPipe's unmatched power comes from TextPipe's unique architecture and combining and arranging it's filters to suit each task. TextPipe can be run both standalone and within DataPipe. Choose the database and table or query that contains the data you need to modify (Click to enlarge). Replace text interactively in preview mode and in live database mode (Click to enlarge). DataPipe is used by Aspect Computing, IMS, UC Davis Medical Center, City of Winnipeg, Trucking2Go, Harrington Industrial Plastics, Trane, United Nations, Intelli-Source, Suramericana de Seguros SA, Johnson & Johnson, East Tennessee Computers, Saskatchewan Learning and many other large organisations. If you have trouble setting up transformations yourself, why not pay one of our data transformation consultants to do it for you?